This video shows you how to build your own heavy-duty solar power energy system in your own home. This guide will show you the basic setup of a solar powered system from start to finish. The best part about this tutorial is that it is scalable. No matter what type of solar panels you are starting out with, you will be able to replicate this and make it work for you. We recommend adjusting the size of the charge controller, inverter, and batteries in according to the solar power what is that you have. Read below to find out how you can make your own solar power energy system yourself.DIY Solar power may seem like a daunting task. Fear not, this video WILL set you on the right path. We start by unraveling the mystery of off-grid solar power and teach you the basics, how to understand and think about your system. From there, we show you how to access and size the proper system for an off grid back-up or full time off grid system. 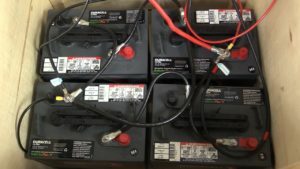 Once you’ve got that squared away, we talk all about batteries. Of all the components, batteries are probably the most misunderstood. There are some nuances in solar power that you must be aware of; this video will set you straight on where to mount and how to wire your panels for the best efficiency.Often the most overlooked component of any off grid system is safety, and for that we’ve got you covered as well. Finally, we finish up talking about living with your new system.